You don't have to compromise security for appearance when choosing a fence. Hire us to install traditional, beautiful cedar fencing on your property. Goodrow's Fencing & Landscaping offers all kinds of residential and commercial fencing services in the Spanaway, WA area. Don't worry if you're not sure which type of fence you should install around your home or business. Our fence installation specialists can go over the benefits of different types of fences with you. Cedar fencing holds up well in all kinds of weather conditions, looks beautiful and resists warping. 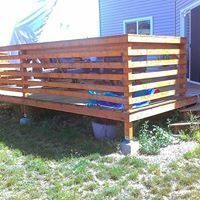 Call right away to schedule cedar fencing installation services. Turn to Goodrow's Fencing & Landscaping for residential and commercial fencing services in Spanaway, WA. Contact us today with any questions about our fence installation services. Copyright © 2019 Goodrow’s Fencing & Landscaping, all rights reserved.